Three whole wild mallards, cleaned and gutted. Rinse ducks thoroughly with cold water. For the Marinade: Place ducks in a stock pot just large enough to fit the ducks snuggly side by side. Mix the marinade ingredients into 2 quarts cold water. Pour marinade over the ducks to just cover the ducks, add more water if needed. Cover and chill overnight or up to 2 days. 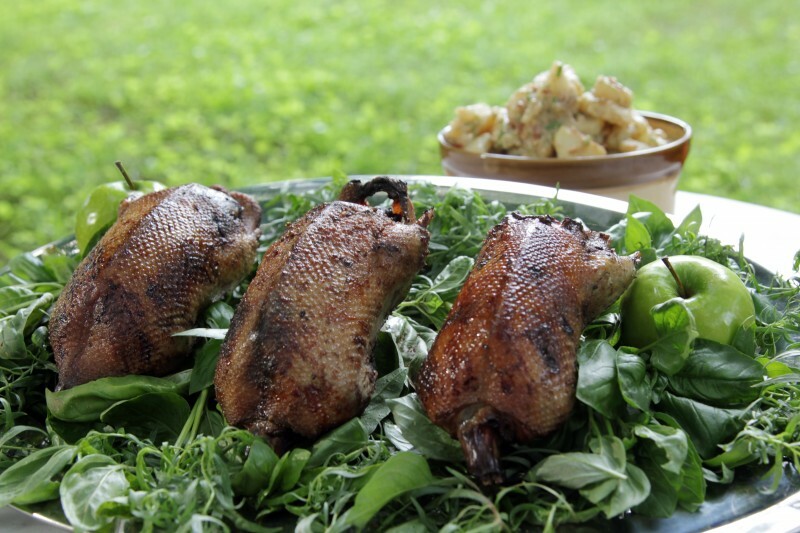 To Barbecue the Ducks: Soak applewood chunks in fresh water at least 30 minutes. Prepare charcoal fire in smoker; let fire burn 20 to 30 minutes. Remove ducks from marinade, and pat dry. Season well with sea salt and freshly ground pepper. To Serve: Serve thinly sliced on warmed plates. Papa's Alsatian Potato Salad is excellent served with the ducks. Sliced duck served in a sandwich with condiments of your choice is delicious.